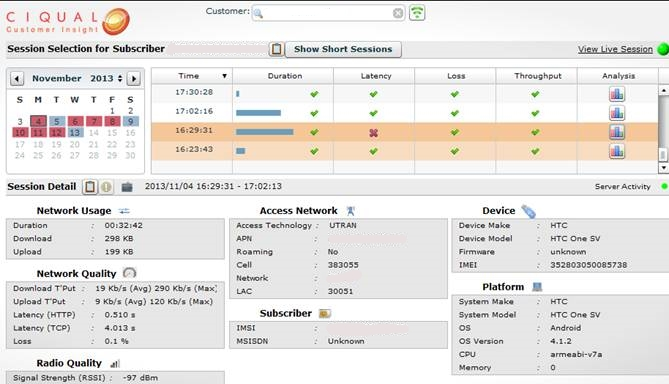 With immediate access to the customer‘s mobile performance history, Customer Service Representatives have a single screen with a breadth of information – including device change history, radio and IP performance records by location and service test measurements – to resolve the issue on the first phone call. Ciqual’s Session Insight solution provides the essential information required to address Mobile issues quickly and reliably. Customer Service Representatives can easily access the user’s real-time and historical records to enable an accurate, first-time-fix of any issue relating to network performance, device performance, user expectation, settings errors, accessing content, and much more. Session Insight automatically identifies the time and location of the customer’s network and service issues, enabling the Customer Service Representative to immediately begin the fault resolution process. This not only reduces the time on the call, it reassures the customer that your service is reliable and up-to-date. (*) as measured in real customer deployments.